In 1958, rock music had passed its infancy. It was more like a toddler. These days, every high school in America (and in most places around the world) has several rock bands slugging it to play parties and concerts, in 1958 rock was not reputable. Not many high schools had a rock band, let alone junior highs. Potola Jr. High, in the East Bay San Francisco Suburb of El Cerrito did. Called The Blue Velvets, they came together when John Fogerty and Doug Clifford discovered a mutual love of the blues, R&B and rock and roll. John bought an 80 dollar Sears Silvertone guitar and amp with a loan co-signed by his mom, earning the $88 to pay it back by delivering newspapers. He retreated to his room in the basement of his mother's house and taught himself how to play. Doug balanced a used snare drum on a flower pot stand and played with two sticks he had lathed down from a couple of old pool cues. Not satisfied with the sound, they invited Doug's friend Stu Cook to join. Stu had studied classical piano for years, but also was hooked on the local R&B station, KWBR, in Oakland. Stu and Doug were born within hours of each other and because of their last names, never sat far from each other in school. The group became the Blue Velvets. By the end of 1959, they were playing sock hops, fairs and parties around the area. Despite being one of the few 'teen bands' in the area, there were just so many sock hops they could play, and during the winter, county fairs are hard to come by. Still eager to perfect their craft, by 1961 the Blue Velvets were hanging around the local recording studios, backing up local artists. In 1959, the group made their first record with John on guitar, Doug on drums and Stu on piano. John recalled the song. "I had my garage band all through junior high and high school, and a semi-recording career, meaning I made my first record when I was in the ninth grade. Three of us from Creedence were the back-up band on a record by James Powell, a black singer from Richmond, California, on a small label, Christy Records. It was actually played on a local rhythm and blues station -- I think it was KWBR -- for about three weeks. It was a typical four-chord slow doowop song called 'Beverly Angel..'"
At the same time the Blue Velvet's were establishing themselves, John's older brother Tom also a gigged locally as a musician and singer. He was doing the high school dance circuit with a band called The Playboys. His vocals were so impressive that he was asked to join one of the top groups in the area, Spider Webb and the Insects. They say he did a version of Bobby Freeman's "Do You Wanna Dance" that would elicit shrieks of delight from the girls in the audience. He also would occasionally sit in with his brother's band. Spider Webb and The Insects broke up in 1959. Shortly after they recorded the tune with Powell, Tom asked his brother's band to back him on a demo. While their friends and family enjoyed the recording of Tom's two tunes, the artists like Pat Boone to whom they sent it returned the tunes with rejection notices. Tom wanted to keep his rock and roll dreams alive, although he was already married and working for the local utility company. He convinced Stu, Doug and his younger brother that he could be an asset to them. He was, after all, considerably older (four years) and already, through his days with Spider Webb, was a local hero on vocals. John had not yet started singing, so most of the Blue Velvets repertoire was instrumental. By Fall of 1960, Tommy Fogerty and the Blue Velvets (as they were now billed) played all of the usual haunts, the school sock hops, parties, fairs and the like throughout Northern California. They also continued to record demos. In 1961, a small Bay Area record company called Orchestra decided they liked a tape of two Fogerty and Fogerty compositions called "Come On Baby" and "Oh! My Love" enough to press them.. A month later, Orchestra released another pair of Fogerty and Fogerty compositions, "Have You Ever Been Lonely" and "Bonita." In June, 1962, Orchestra gave the band one more chance. They put out Tommy Fogerty and The Blue Velvets' "Yes You Did," backed with "Now You're Not Mine." The record did far more poorly than the previous release. "It died," Tom would say years later, "before it even came out." This would be the last record Tommy Fogerty and The Blue Velvets ever put out. In 1963, a jazz artist named Vince Guaraldi put out a single called "Cast Your Fate To The Wind." It became that rarest of entities, a jazz instrumental hit. PBS did a special on the "Anatomy of a Hit." Watching this special, the band got excited when they discovered the label was Fantasy, still across the bay in San Francisco. The fact that a local record company was breaking music on a national scale impressed the band. In March of 1964, John and Tom took some Blue Velvet's original instrumentals to Fantasy, hoping to sell the tunes to Guaraldi. The band's energy and audacity impressed Fantasy records co-founder Max Weiss. He signed them as a rock group rather than just for their instrumentals. He also suggested they change their name, the Blue Velvets sounding so passe and 50s. They chose The Visions. Between the time they recorded "Little Girl (Does Your Mama Know)" b/w "Don't Tell Me No Lies" and the release of the 45, Beatlemania happened. Hoping to capitalize on this, without having to go to England and sign a Merseybeat band, Weiss released the record as "The Golliwogs" a sobriquet the band would live with for the next three and a half years. Like the Blue Velvets before them, the Golliwogs played frat parties, military bases, and, despite being considerably shy of their twentyfirst birthdays (except for Tom, who had four years on the rest of the band) bars up and down the West Coast. The public address systems at most of their gigs were of dubious or nonexistent quality. This proved to be a bit of a strain on Tom. During a down period in the band, John had taken a two week gig up in Oregon and developed some confidence in his own singing. John started taking over the vocal chores. He screamed the vocal to compensate for the poor PA systems and developed that raspy, blues dripping holler that would be his trademark from then on. Stu, in the meantime, was moving from piano to electric bass. Tom was becoming more proficient on guitar. They started working out these musical changes at any venue that would pay them for playing. One of these places was a go go bar in Berkeley called The Monkey Inn, which they would later describe as "a scuzzy beer tavern." It played a formative roll in the band's development. Being musicians was not paying the bills, though. Now out of High School, the Golliwogs had to go to work to support their musical habit. Tom had his job with the power company and a young family. Stu and Doug went to San Jose State College, pledging the same frat. John got on the payroll at Fantasy as a shipping clerk. They practiced evenings and played weekends. John honed his chops in the studio. And the Golliwogs made records. These were also formative years for John Fogerty the songwriter. He worked hard at his craft, but in retrospect, he called most of the Golliwogs' songs "very contrived. Everything I could think of in a commercial record, I'd stick in." During October of '65 they recorded a song called "Brown Eyed Girl" (not the Van Morrison tune). It started to make a buzz and actually sold better than 10,000 copies. It was the only single the Golliwogs made that wasn't a total stiff. However the follow up to "Brown Eyed Girl," a Tom Fogerty composition called "Walk on the Water" failed to generate any excitement at all. (An updated version on Creedence Clearwater's debut album several years later, would.). The Golliwogs remained undaunted and kept on honing their craft. They did the frat/bar/club scene for three years. Doug had quit school and gone to work by this time. Stu's dad, a lawyer, had a law school all picked out for his son, now into his last year at San Jose State. Tom was into his fifth year with the power company. Uncle Sam notified John and Doug that he wanted them. They became reservists in different branches of the service. During their six months of active duty, the band got put on a back burner. Stu graduated at about the same time as John and Doug finished their tour of active duty. While they still faced monthly meetings and camp, this meant nothing more inconvenient than going entire weekends without sleep every now and again. However, none of the Golliwogs were kids anymore. By the Summer of 1967, the members of the band faced hard choices about what to do when they grew up. The fate of the Golliwogs was uncertain. Stu sold the car his father had given him as a graduation gift. He and Doug rented a small pink house, where the band hung out and rehearsed. Tom quit his job. They pooled their money, paying off the creditors with the shotguns and leaving the rest until they also got nasty. They played as often as they could get jobs, and the money started to get a little better, but not much. By fall, the band was in pretty dire straits The Weiss Brothers had been in the record business for nearly 20 years, and had a lucrative plastics business even before that. They were ready to get out of the business and take it easy. Saul Zaentz, a salesman for the company, put together a group of investors and bought Fantasy. As a shipping clerk, Fogerty knew Zaentz, and Zaentz knew Fogerty. They had a good relationship. He told John that he liked the Golliwogs, but they needed to make some changes. He saw what was happening in the Bay Area music scene with the rise of "underground radio" and venues like the Filmore presenting shows with groups like The Grateful Dead and The Great Society (who would become the Jefferson Airplane). They changed the name to Creedence Clearwater Revival, after a friend of a friend of Tom's, Credence Nuball. The first name, with its connotations of believability and integrity, appealed to the group. Clearwater also had two meanings. It came initially from a beer commercial, but also resonated with the burgeoning environmental movement of the time. Revival, however, had one meaning. It was the band's aspiration, that after four years as the Golliwogs, after ten years of playing together, this new change in their fortunes would take the band where they all knew it could go. John would often say, "The most important part was revival." The newly named band released a single, Porterville, then went into the studio to cut their album. One of the tunes they cut was an extended version of one of their live favorites, Dale Hawkins' "Susie Q." Even before the album was pressed, "Suzy Q" was on the radio. KMPX one of the more popular free-form FM stations in the Bay Area, played tapes the band brought them after the band had supported a DJ strike, playing a benefit concert, and the like. So even before the record came out, it started to generate excitement on the West Coast. They played to a packed house at the LA club The Cheetah. Bill Drake, one of the most powerful people in pop radio at the time, decided he really liked the tune and suggested it to the radio stations that used his services. At this juncture, though, the band couldn't go too far from home. Doug and John still had to get to reserve camp one weekend a month. This impediment disappeared as they both got discharged from the service at almost the same time. In 1969 the group charted with three separate albums. Their eponymous debut, Creedence Clearwater Revival peaked at #52. Bayou Country peaked at #7, largely on the strength of the monster hit single, "Proud Mary." That tune topped out at #2 on the charts, beginning of a long history of songs by the band that go shut out of the top spot on the chart. The third LP of the year, Green River also hits #7, the song "Bad Moon Rising" peaking at #2. 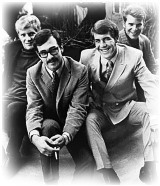 Willy and the Poor Boys, appeared near the beginning of 1970, peaking at #3 on the album charts. The single "Down on the Corner," released late in 1969, foreshadowed the album. The a-side of the singe reaches a chart peak of #3. The flip side, "Fortunate Son," has a chart peak of #14. The album also featured several other notable songs, like a reworking of Leadbelly's "Midnight Special." "It Came Out Of the Sky" showed John's prescience as a songwriter, taking one of the first musical swipes at Ronald Regan. The band toured all over America, mostly playing weekends. After ten years of struggle, the year and a half of astonishing success started to spawn dissension in the band. Fogerty took the reigns hard. When the band recorded "Down On the Corner," one band member complained, `This isn't rock and roll.' Looking for outside satisfaction, Doug produced a record for Mark Spoelestra. Cosmo's Factory came out in September of 70. The album has a chart peak at #1, both in America and in England, the band's only #1 album over there. "Traveling Band" had already had a chart peak at #2. "Who'll Stop The Rain," the single's B-side, hit #13. One of Fogerty's first public political statements (aside from the gentle jibe in "It Came Out of the Sky,") the song is an allegory about the situation in Vietnam. When the Beatles announced their break up in the winter of 1970, CCR became the most successful band and the biggest singles act in the world, despite never landing a #1 single. Always very private, the group never became stars personally to befit their status on the pop charts. They sought to change that with the release of Pendulum. Before the album's release, they had a fan type book written. Called "Inside Creedence", the book took about six weeks from the time it was conceived until it was actually published, coincidental with the release of Pendulum. In fact, many copies of the book were sold packaged with the record. The band also made a television special and had a $30,000 press junket to ballyhoo the album. The record shipped a million copies. There were signs of internal dissension at the junket party. Stu Cook beefed to Rolling Stone about lack of respect he felt the band received. "We're tired of that riff about John Fogerty's back-up band." Tom Fogerty, although one of the instigators of the party, became reticent during the event. He's the only band member not directly quoted in the coverage. I left because of a falling out between John and I about the music itself and how much I could contribute." The band decided to continue as not only a trio, but a democracy. Unfortunately, the members all had different ideas about how to democratize the band. The result is Mardi Gras, referred to as the worst record ever made by a major band. After touring Europe as a trio, the band called it a day on October 16, 1972.